"...together with its subsidiaries, provides infrastructure solutions for communications networks worldwide. It engages in the design, manufacture, and marketing of electronic, coaxial, and fiber optic cable products for data networking, Internet access, wireless communication, telephony, and other broadband applications." On April 26, 2007, CommScope announced 1st quarter 2007 results. For the quarter ended March 31, 2007, the company reported sales of $435.5 million, up 24% from last year's sales of $352.3 million in the same quarter in 2006. Net income was $45.9 million in 2007, up sharply from $12.7 million in 2006 same quarter. 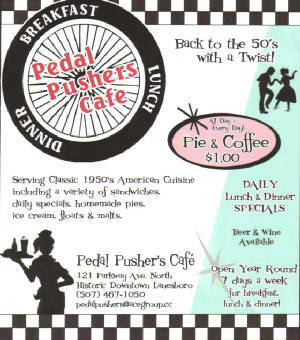 Earnings per share came in at $.63, up more than 200% from the $.19/diluted share reported in the first quarter of 2006. The company raised guidance for fiscal 2007 from sales of $1.72 to $1.76 billion to a new estimate of $1.84 to $1.89 billion. This report beat expectations of sales of $420.1 million and earnings of $.52/share. Thus the company not only came in with strong results, but they beat expectations and raised guidance. 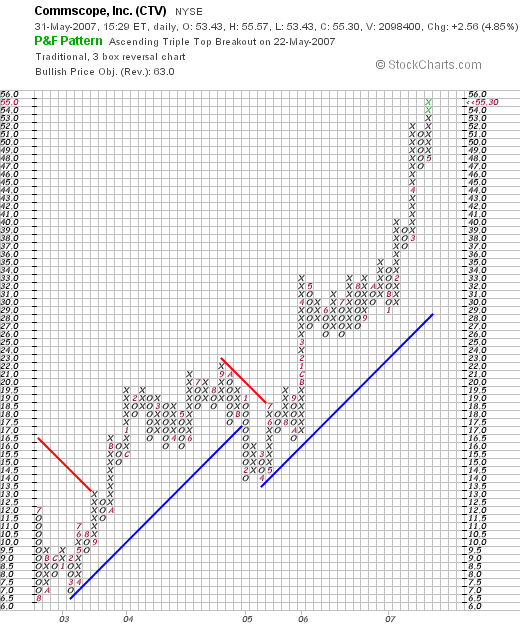 There isn't much more a company can report that is more bullish for a stock than this! Examining the Morningstar.com "5-Yr Restated" financials on CommScope, we can see that revenue, which took a dip from $598 million in 2002 to $573 million in 2003, has subsequently grown strongly to $1.62 billion in 2006 and $1.71 billion in the trailing twelve months (TTM). Earnings which dipped from a loss of $(1.10) in 2002 to $(1.19) in 2003, turned profitable at $1.15 in 2004, dipped to $.78/share in 2005, but then once again resumed a climb to $1.84/share in 2006 and $2.28/share in the TTM. The company has maintained a stable number of shares outstanding with 61 million reported in 2002, and 61 million reported in the TTM. Free cash flow has been solid with $95 million in 2004, dropping to $66 million in 2005 before increasing to $87 million in 2006 and $119 million in the TTM. The balance sheet is excellent with $459.8 million in cash, more than enough to cover the $197.4 million in current liabilities more than twice over. In fact, the total current assets, including the $438.7 million in 'other current assets' is $898.5 million, yielding a current ratio of 4.55. Looking at Yahoo "Key Statistics" on CTV, we can see that the company is a mid cap stock with a market capitalization of $3.35 billion. The trailing p/e is a moderate 24.10 with a forward p/e (fye 31-Dec-08) estimated at 19.20. The PEG (5 yr expected) is estimated at a reasonable 1.31. Reviewing the Fidelity.com eresearch website, we can see that the Price/Sales (TTM) is a reasonable 1.85, compared to the industry average of 4.30. Profitability is quite good at 22.59 Return on Equity (TTM) compared to the industry average of 21.66. Finishing up with Yahoo, there are 61.23 million shares outstanding with 60.53 million that float. As of 4/10/07, there were 3.87 million shares out short, representing 6.4% of the float or a somewhat significant 3.7 trading days of volume (I use 3 days as my somewhat arbitrary cut-off for short interest significance). No dividend and no stock splits are reported on Yahoo. 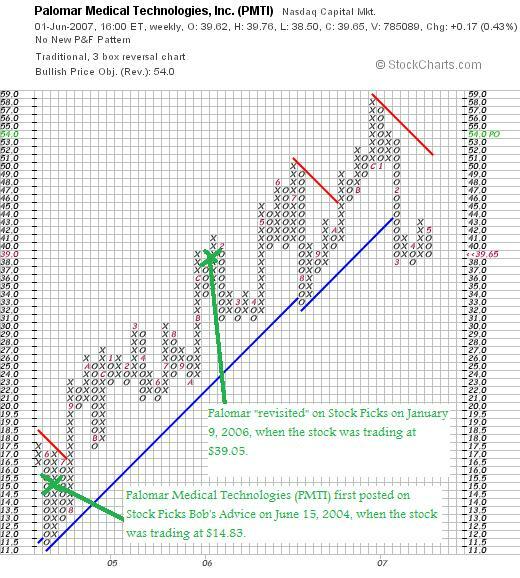 Reviewing the "Point & Figure" chart on CTV from StockCharts.com, we can see that except for a slight price dip in January, 2005, the stock has moved steadily higher from the $6.50 range in August, 2002, to the current level of $55.30. Simply put, this appears to be a very strong, if not slightly overextended, chart. For a variety of reasons I like this stock. Let's go over a few things I just discussed. 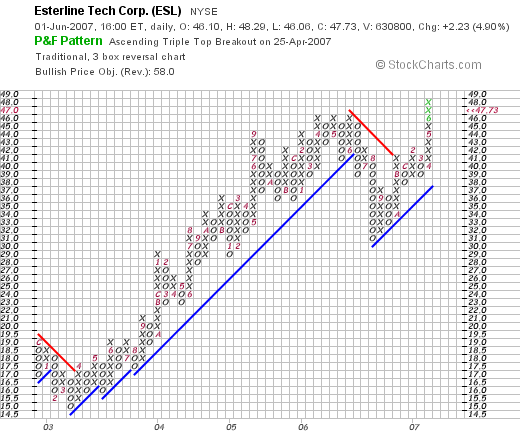 First of all, the stock is moving strongly higher today suggesting good price momentum. The latest quarter was solid. The company beat expectations for both revenue and earnings and went ahead and raised guidance. They have been doing well for the last several years with steady revenue and earnings growth without expansion of the outstanding shares. Free cash flow is positive and growing and the balance sheet is solid. Lots of cash. Valuation-wise the p/e isn't too high in the 20's and the forward p/e is better in the teens. Looking at the PEG, the company is appropriately valued with a PEG under 1.5. The Price/Sales ratio is good for its industry and the Return on Equity is better than average as well. Finally, the chart looks very strong. What else could an investor want? Anyhow, if I were buying a stock, this is the stock I would be buying today. Meanwhile, I shall be filing it away into my 'vocabulary' of stocks, waiting for the appropriate time to buy....if that should arise! Thanks again for visiting! If you have any comments or questions, please feel free to leave them on the blog or email me at bobsadviceforstocks@lycos.com. If you get a chance, be sure and visit my Stock Picks Podcast Website where, if I get a chance, I shall be adding a new episode soon. A Reader Writes "...have you found using margin to be a good investment?" Hello Friends. Thanks so much for stopping by and visiting my blog, Stock Picks Bob's Advice! As always, please remember that I am an amateur investor, so please remember to consult with your professional investment advisers prior to making any investment decision based on information on this website! I was wondering if you could share your thoughts on using margin. The 10% interest rate seems steep but the increased buying power is a big draw. I realize you are trying to buy down your margin, but overall have you found using margin to be a good investment? Would you suggest using it with an interest rate as high as 10%? I think this deserves an honest response. I spend a lot of time preaching against using margin and then I go and use it! It is certainly one of those "Do as I say, not what I do!" moments. But I certainly do not believe that margin, or buying on leverage, is a good idea for most investors. It simply increases the volatility of one's account. In an up-market, it certainly does help. But it also magnifies losses on the way down, so that is the part that all of you 'newbies' are not quite as familiar with. That is why I stopped at 20 positions as my margin balance really became unrealistic. If anything, I wouldn't recomment getting below 80% equity levels on margin or borrowed money. If you are to have margin at all. Currently, my own Trading Account, even after the big rally and my latest sale, sits at $53,853.72. I have $66,205.55 in margin debt. My total holdings stand at $120,059.27. Thus, I am sitting at a 44.85% margin level. Way too much debt to make me comfortable. It is well known that margin contributed to the calamity of the Great Crash in 1929. At that time people were putting, as I recall off the top of my head, like 10% down. Currently minimum margin requirements are as low as 30%. I am really not that far above the minimum level to avoid what is called as a "margin call". Different equities have different margin requirements. So while I believe in an aggressive and disciplined trading and investment approach. My own goal is to eliminate margin and to use my own trades and sales to do so. By the way, year-to-date, I have a net of $12,309.61 in realized gains so far, including a net of $3,062.06 of short-term gains and $9,247.55 in long-term gains. These are real profits based on net sales of stocks including losses and gains combined. So the market has been kind to me. In addition, I have $32,335.12 in unrealized gains which represent my net of profits and losses that are still paper profits, that are what would happen if I sold all of my 20 stocks today. So the market is kind to me. I do not plan on moving beyond 20 positions until I have reduced my margin balance significantly. I may move back to 25 if I get to 80% equity levels. Or I may wait to pay off the whole thing. I will keep you posted :). Thanks so much for commenting and visiting. If you have any other questions, or any of you other readers, (is that good English? ), then go ahead and leave them on the blog or email me at bobsadviceforstocks@lycos.com. Ventana Medical Systems (VMSI) "Trading Transparency"
A few moments ago, with the market shrugging off the China sell-off news in the States, my Ventana Medical Systems (VMSI) hit a sale point on an appreciation target. I sold 26 shares of VMSI at a price of $51.64. This represented 1/7th of my position of 188 shares which were purchased on 4/16/04 with a cost basis of $23.47. Thus, my shares had hit an appreciation of $28.17 or 120% from purchase. I have sold shares of Ventana three times previously--at a level of 30, 60, and 90% appreciation targets--and had been waiting for the 120% appreciation level to trigger a partial sale--I am now selling 1/7th of my remaining position--and did so! Since I am at my 'new' maximum of 20 positions (which I adjusted downward from 25 in light of my hefty margin level of about 50%), I shall be 'sitting on my hands' with the proceeds of this sale, applying it to my margin balance, and waiting until I once again dip below 20 positions before using a sale at a gain ("good news") to give me that "permission slip" to add a new position to my portfolio. When shall I sell Ventana next? On the upside, my next four sale points shall be at 60% intervals--that is, at 180, 240, 300 and 360% appreciation levels--if they are reached. At those levels, I shall be selling 1/7th of my remaining shares. A 180% gain would mean the stock price would have to reach 2.80 x $23.47 = $65.72 before selling once again some additional shares. Since I now have 162 shares, 1/7th of that total would mean a sale of 23 shares at that higher level. On the downside, I certainly reserve the right to sell all of my remaining shares on any fundamentally bad news announcement. On a price basis, should the shares decline to 50% of the highest targeted appreciation level, that is since I just sold at the 120% appreciation level, if shares should dip back to 60% appreciation levels or 1.60 x $23.47 = $37.55, then likewise, I shall be selling all remaining shares of that position. Thanks so much for stopping by and visiting! If you have any comments or questions, please feel free to leave them on the blog or email me at bobsadviceforstocks@lycos.com. If you get a chance, be sure and visit my Stock Picks Podcast Website where I discuss many of the same stocks I write about on the blog. I hope that all of you in the States are having a nice Memorial Day. I certainly would like to express my words of appreciation for all those young men and women who are serving their nation today and to remember all of those who have died in current and past conflicts. We need to be proud of them and yet at the same time double our own efforts at improving understanding among all people and trying to make war and conflict a thing of history. 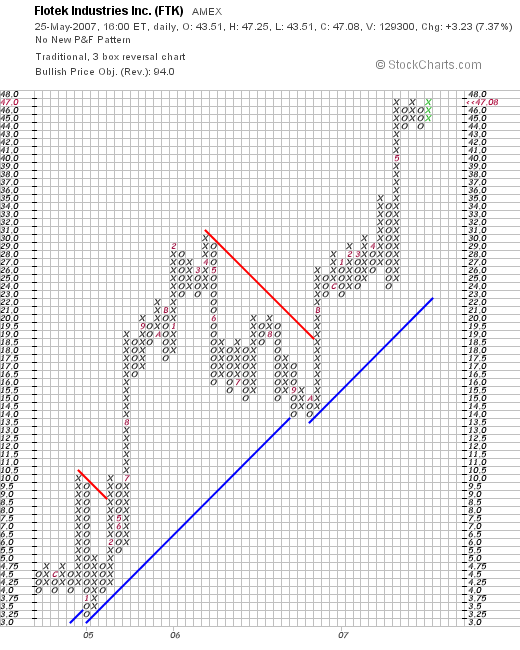 As part of my blog I have been trying to use the weekend as a time to review past stock picks. These review assume a buy and hold strategy. I do this due to the ease of review. I am rather 'low-tech' on this blog, and it is easy to look at past stock picks and simply see how they have changed in price. However, in practice, I utilize a very disciplined portfolio investment strategy that requires me to sell stocks both on small losses as well as partial sales on appreciation targets. The difference in these strategies would certainly affect performance outcome and should be taken into consideration when reviewing the results I shall be discussing. 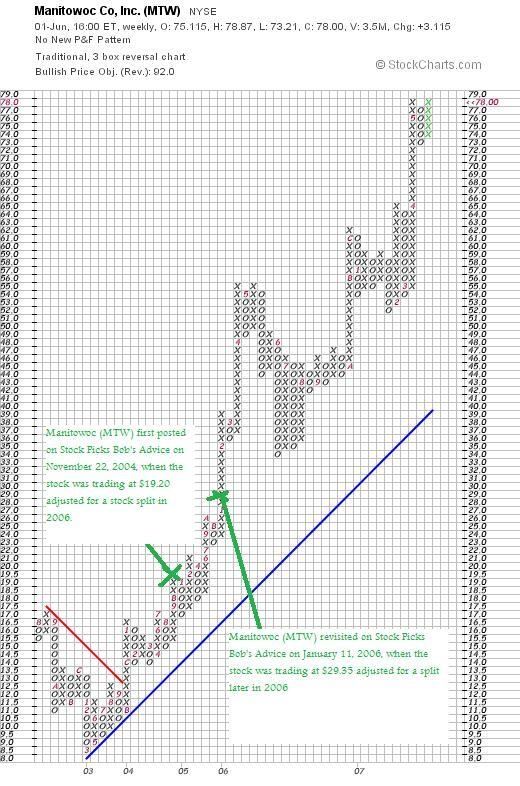 Last week I reviewed the week of December 26, 2005; going a week ahead, let's take a look at the stock picks discussed on this blog during the week of January 2, 2006. If you are interested in looking closer at these selections (or others) I would encourage you to use the links on Stock Picks Bob's Advice along the left side of the entries that will get you to all of the past entries on this website by date. 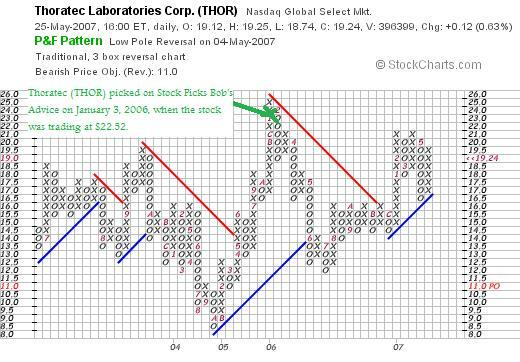 On January 3, 2006, I reviewed Thoratec (THOR) on Stock Picks Bob's Advice when the stock was trading at $22.52. I do not own any shares of this stock. THOR closed at $19.24 on May 25, 2007, for a loss of $(3.28) or (14.6)% since posting. On May 3, 2007, Thoratec (THOR) reported 1st quarter 2007 results. Revenue for the quarter came in at $57.3 million, up 18% from last year's $48.8 million in the same period. However, the company came in with a loss of $(930,000) or $(.02)/share. "Excluding items", the company came in at a profit of $4.3 million or $.08/share, up from $3.2 million or $.06/share last year. This was good enough to beat expectations of $.07/share on revenue of $54.4 million. 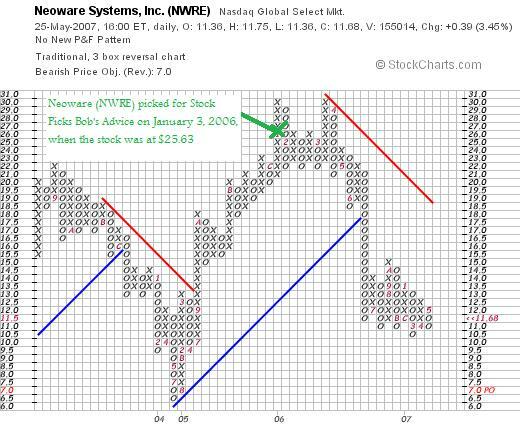 On January 3, 2006, I 'picked' Neoware Systems (NWRE) for Stock Picks Bob's Advice when the stock was trading at $25.63. Neoware (NWRE) closed at $11.68/share on May 25, 2007, for a loss of $(13.95) or (54.4)% since posting. I do not own any shares of Neoware. 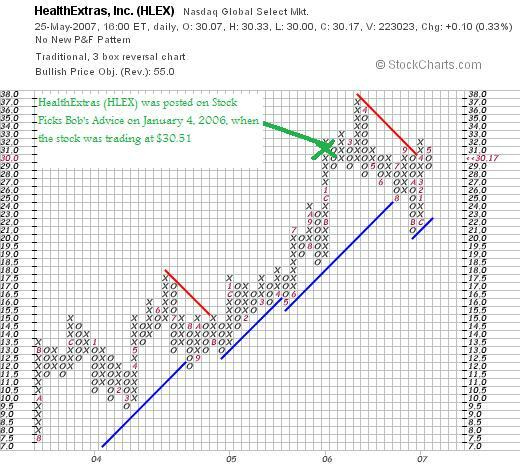 On January 4, 2006, I posted HealthExtras (HLEX) on Stock Picks Bob's Advice when the stock was trading at $30.51. HLEX closed at $30.17 on May 25, 2007, for a loss of $(.34)/share or (1.1)% since posting. I do not own any shares of HLEX. On May 7, 2007, HealthExtras announced 1st quarter 2007 results. For the quarter ended March 31, 2007, revenue totaled $406.4 million, up 70% from first quarter 2006 revenues of $238.7 million. Net income came in at $9.7 million or $.23/share, up 69% from $5.8 million or $.14/share the prior year same period. Apparently, analysts were expecting $.23/share in earnings which HLEX met, but revenue had been expected to come in at $415.4 million with HLEX reporting revenue results slightly under this amount. 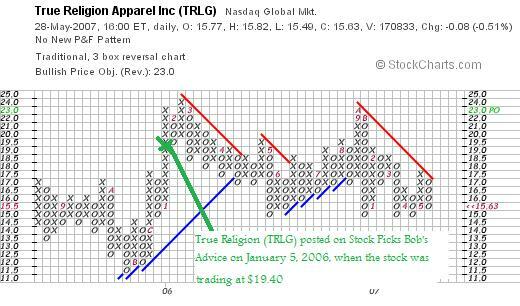 On January 5, 2006, I posted True Religion Apparel (TRLG) on Stock Picks Bob's Advice when the stock was trading at $19.40/share. TRLG closedat $15.63 on May 25, 2007, for a loss of $(3.77) or (19.4)% since posting. I do not own any shares of this stock. 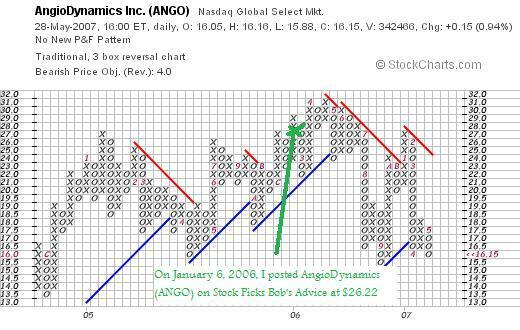 Finally, on January 6, 2006, I posted AngioDynamics (ANGO) on Stock Picks Bob's Advice when the stock was trading at $26.22. 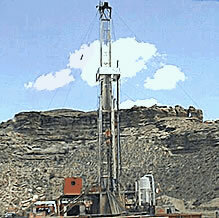 ANGO closed at $16.15 on May 25, 2007, for a loss of $(10.07)/share or (38.4)%. I do not currently own any shares of AngioDynamics. On March 27, 2007, AngioDynamics reported 3rd quarter 2007 results. 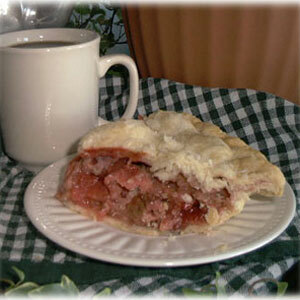 Net sales increased 35.1% to $26.7 million compared with sales of $19.8 million in the third quarter of 2006. However, the company reported an operating loss of $10.5 million which included R&D expense of $12.1 million "associated with the RITA Medical acquisition." This worked out to a loww of $(.55)/share compared with a profit of $.14/share the year-earlier. So how did I do during this week over the New Year's holiday in 2006? In a word, AWFUL! I had five "picks" and EVERY SINGLE ONE DECLINED! How is THAT for TERRIBLE? The average loss worked out to a loss of (25.6)%! This review I hope points out a few salient points. First of all, I am trying very hard to be scrupulously honest on this blog, and in addition am quite capable of picking stocks that decline. I have been asked multiple times why I hold to my 8% loss limit. Why not buy more shares if you like the stock I am asked. It is because of stock picks like this that require me to be disciplined. So no, there is nothing magical about what I do. Sometimes I pick GREAT stocks, companies like Bolt (BTJ) or Precision Castparts (PCP) or Coach (COH). But there are many times that my process results in stocks that don't work out. Companies that find their fortunes changing; an event that the individual investor cannot hope to anticipate. However, we can respond to the market's actions. We can limit our losses in our own accounts, and we can continue to strive to find the right "frog"! Have a great weekend everyone...what's left :). And if you have any comments or questions, please feel free to leave them on the blog or email me at bobsadviceforstocks@lycos.com. If you get a chance, be sure and visit my Stock Picks Podcast Website.